Enjoy beautiful Miami, Florida with kids as you see some of the world’s most exotic animals in a unique tropical zoo. Then round out the day and your experience with a bit of outdoor activity for the more active family to enjoy some sun and fun. See all that this famous city has to offer children and adults on a great day in sunny Miami. Unleash your wild side at the only tropical zoo in the United States. Located on 740 acres, Zoo Miami is the largest zoological garden in Florida. The zoo is home to over 2,000 animals and has over 100 exhibits. The animals are divided by geographical region. The African exhibit area features animals from all over the African continent, including African elephants, giraffes, rhinos and zebras. The zoo’s Asian exhibit area features a multi-leveled Asian River Life Experience, replicating an Oriental river brook. Animals in this area include Asian elephants, Sumatran orangutans, leopards, komodo dragon and others. Koalas and kangaroos are among favorites at the Australian region. The Amazon and Beyond exhibit takes visitors through the forests of Central and South America, which is filled with colorful amphibians, reptiles, monkeys, and several other fascinating creatures. Young visitors will enjoy the Children’s Zoo, where they can interact with a variety of small animals. Key Biscayne, a beautiful island south of Miami Beach, offers excellent beaches and Bill Baggs Cape Florida State Park. This 400-acre park is home to the Cape Florida Lighthouse, the oldest standing structure in Greater Miami. With over a mile of sandy Atlantic beachfront, the park is a great place for snorkeling and swimming. There are several recreational activities available including bicycling, camping, canoeing, kayaking, fishing, hiking and picnicking. Guided tours of the lighthouse are given twice daily, Thursdays through Mondays. There are two restaurants located within the park, Lighthouse Cafe and Boater’s Grill, both offering delicious cuisine. 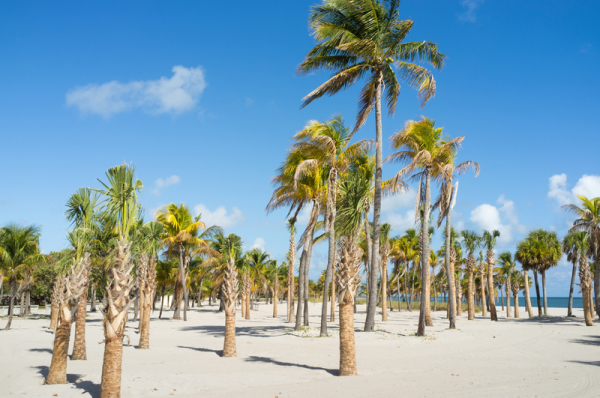 Whether you sunbathe on the relaxing beach or explore the hiking trails, Bill Baggs Park has something for the whole family to enjoy. Interested in booking or planning a vacation to Miami right now? Check out some of the amazing offers currently available for airfare and hotels at Kayak, Orbitz and Priceline. See more lodging options at Hotels.com and Hilton. Get started on your next trip today!